There are a lot of things that I would LOVE to do with the local running community but the events that I attend are few and far between due to our family/work schedule. 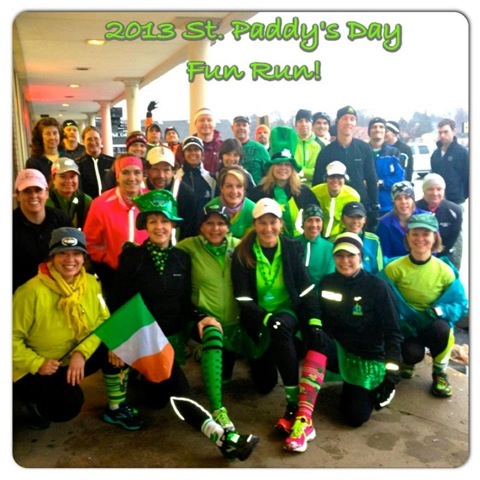 Last night, however, was the Running For Kicks St Patrick’s Day Fun Run and hubby managed Mr. Michael, plus the chauffeuring so that I could go enjoy the festivities. And of course, I was late, so missed the group photo and the beginning of the run. All photos stolen from courtesy of Gail. On a normal, or even slightly chaotic day I would have had plenty of time to get to the event. However, I neglected to anticipate that a gentleman in the parking garage would jam up the pay machine, or that the new valet would not be able to “find” my car. So I spent an extra 20 minutes in the parking garage but still had plenty of time. Then I hit the expressway for the short trip from Chicago to Palos and traffic was at a standstill. Rain. Accidents. It took an hour to travel from 22nd street to 95th street. Not normal. Not enough time. Now, I’m late. I really dislike being late but really, this wasn’t the end of the world. I was just thankful that I wasn’t rushing to get Aby or Michael and that they were covered. I was glad that I went. Even though I was late and the group had already started, I headed over to the route they normally run and just started running. I found a few people, socialized a bit, made a few random loops and managed to get in 4.5 miles of hills. Win! 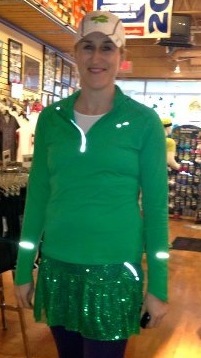 It’s not every day you can run around in a sparkle skirt, so given the chance, TAKE IT! And just maybe, you’ll spot a few other crazies sparkly friends too! I love these fun events and am thankful to RFK for doing things like this so we can dress up and be crazy without actually putting out $$ on a race. Good times! 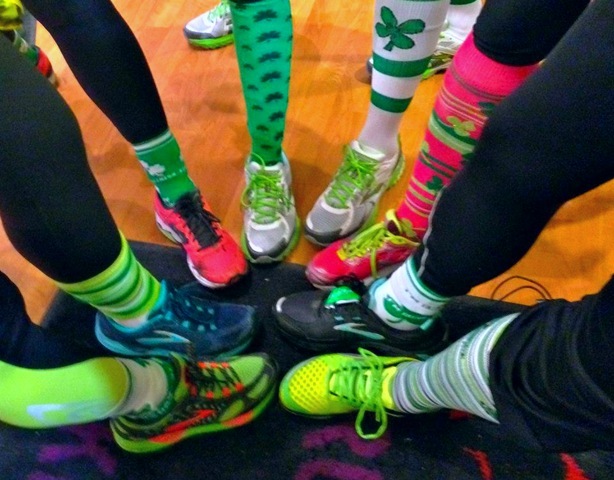 This entry was posted in "Run"Way Fashion, Running and tagged Dressing up for a St Patrick's Day Run, fun socks, Pro Compression discount code for St Patricks Day socks, Pro Compression St Paddy's Day socks, race out fits, Running For Kicks, running in fun socks, St Patrick's Day Run by tootallfritz. Bookmark the permalink. I know! It’s almost impossible to know how long it will take to get anywhere anymore. Took me 2 hours to get in yest morn, then I don’t even know how long my total commute was on the way home (minus the RFK detour) last night. Looks like a blast. That’s a lot of green gear! I really wish I could attend RFK and F’NRC fun runs, but unfortunately, that is the caveat of working second shift. They look like so much fun. Awesome TTF and glad you get to do something your way in such hectic life! I empathize with trying to navigate that traffic. I never seen such a mess S-bound Dan Ryan that comes to a stop and crawl before 90 skyway split and I57 split, then comes to a crawl on Borman where Stony Island merges. What a mess in design and way too much combustion-based vehicles in this world. Accidents or snow…will make it even worse. I don’t make many if any “fun-runs” on Mondays in the winter and usually don’t do them regularly until in summer/Chicago/fall marathon training. I may not be in that Chicago schema anyways since I didn’t get in on the first day, and out on the “lottery” application. 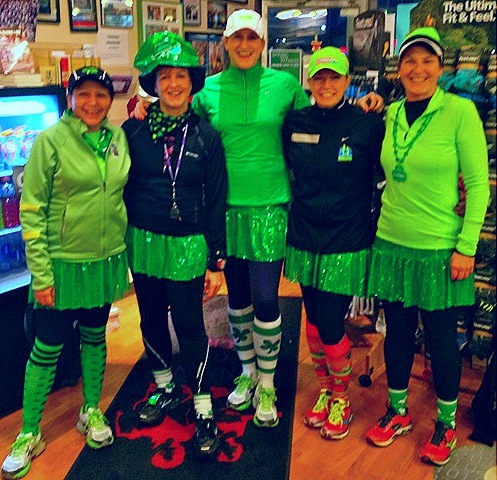 Loved all that green in the pics and sparkle skirts cool…seems like everyone got the Paddy’s Day spirit! Great job on those hills! I LOVE sparkle skirts, and have a few of them myself!